Click on the links below for the simple how to answers...and lots of extra information and ideas. Plants and fruit below. 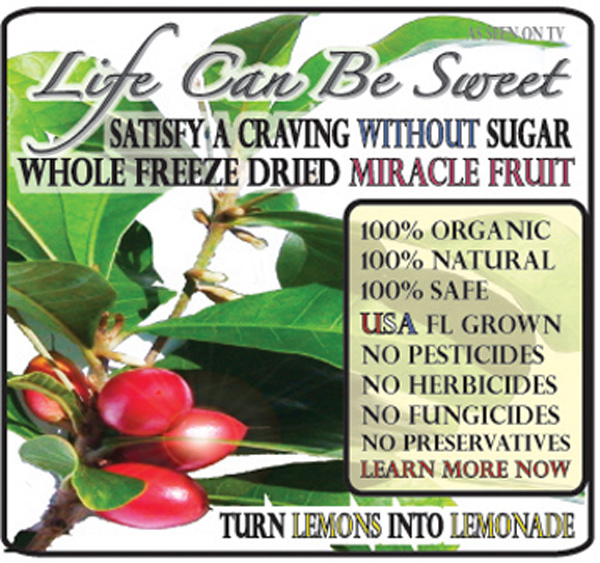 Miracle Fruit, Seeds and Plants..........Life Can Be Sweet ! 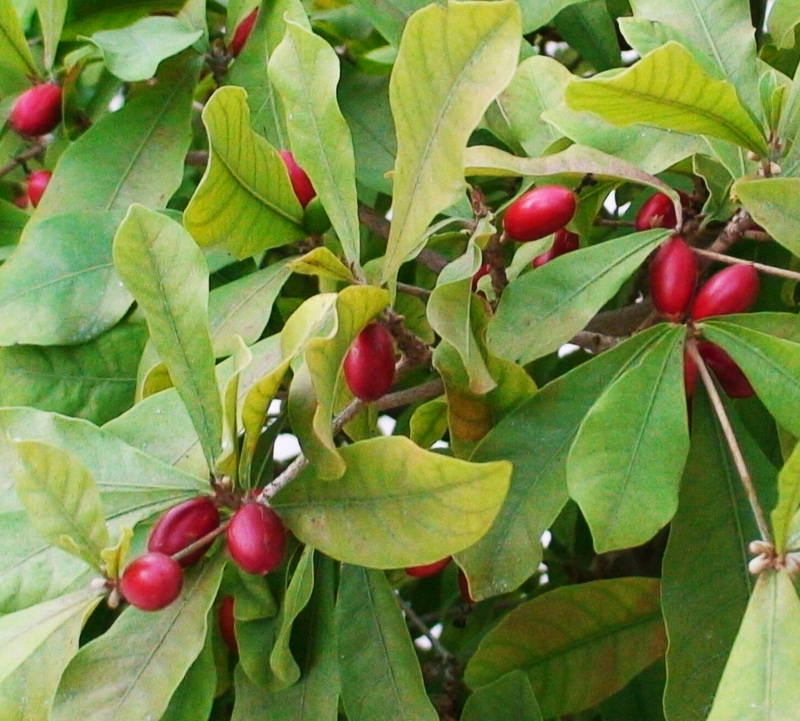 The Miracle Fruit Plant, sometimes known as Miracle Berry, or Magic Berry (Sideroxylon dulcificum/Synsepalum dulcificum) is a plant first documented by an explorer during a 1725 excursion to its native West Africa. 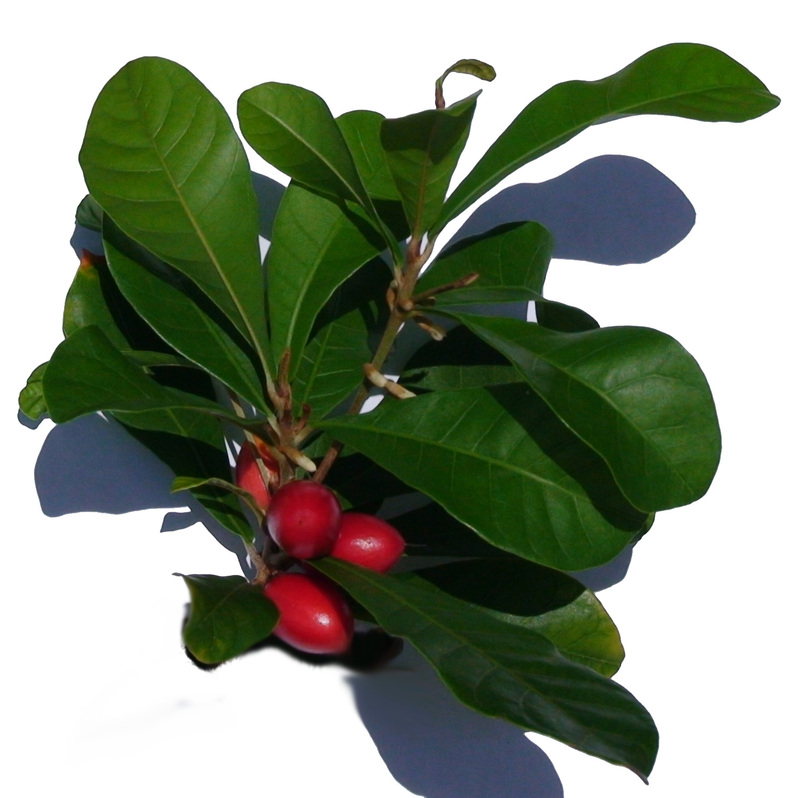 It is an evergreen plant that produces small red berries the size of small grapes throughout the year. These fruits have been consumed for hundreds of years with no reported ill effects. Growing instructions click here. It prefers an acidic well draining soil with 50% sunlight or less as a container plant. It does well indoors and is happy on a windowsill. Easy to care for and slow growing. Few pests and fewer diseases. Prefers high humidity and to be kept warm. Will not tolerate a hard frost. The berry is slightly sweet, and contains an active glycoprotein molecule called miraculin. When eaten this molecule binds to the tongue’s sour receptor taste buds, causing bitter and sour foods (such as lemons and limes) consumed after to taste sweet. Your sour receptors do not send the sour signal. This effect lasts between thirty minutes and two hours. 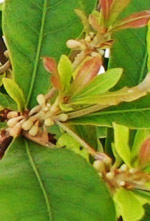 It is not a sweetener, as its effects depend on what is eaten afterwards, but has been used to sweeten bitter medicines and lessen most chemotherapy aftertaste to help restore apetite. Most famous for the sweet lemon trick; eat a miracle fruit and lemons taste sweet. Learn more click here. Availability is on a first come first served basis. At present we have over 1000 plants in various sizes. Growing instructions click here. 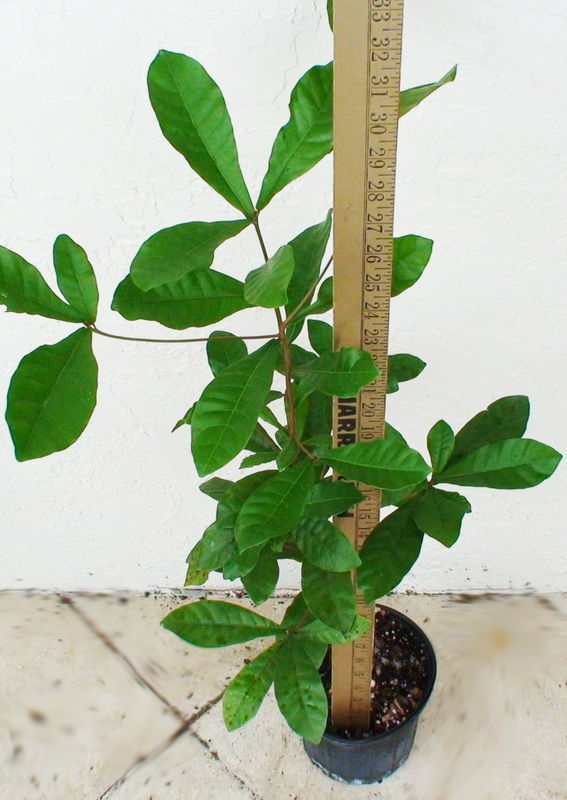 The Plants we offer are always the best we have in that size category. The pictures to the right are our average plants in that range. Click on them for a close up view! They are guaranteed to thrive with the proper care. Complete instructions will be included, and we offer free phone support too. * Sometimes demand spikes and some items may be backordered. To be fair we accept orders and fill them in the order they were placed. Once we are sold out of any category below, any orders placed in excess of our saleable stock will be held till we can fill it, we will contact you and let you know the expected wait time...if not acceptable any monies collected will be refunded immediately. HOW OUR ORDER SYSTEM/WAIT LIST WORKS: You must completly fill out our order form. You will 1st get an order #, then will be asked for payment information. If you are on a waiting list: payment, unless you choose Pay pal is not immediate. When we have stock of fruit or plants and can ship we will contact you. If we are not able to reach you within a day or two to confirm payment and shipping information, we will skip your order. If you choose to pay by credit card (second option) we will not charge your card until we are ready to ship. Please make it easy for us to reach you by adding your phone# and email. All orders will be filled in turn and you will be notified of the expected wait. 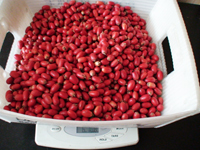 Choose Quantity 0 @ $0.00 ea = $0.00 Freeze Dried Whole Miracle Fruit Berries - Plenty in stock - Check the Price a real bargain ! World Exclusive! We take our best fruits, flash freeze them and place them in a freeze dryer which super-freezes and then slowly removes all ice as water vapor under heavy vacuum while keeping the fruit at sub freezing temps. We are left with a perfect fruit in whole form...no preservatives and stable for a year at room temp in our special foil seal packaging. We can now ship anywhere without the big expense of overnight or frozen items that can spoil or are soggy. No more will the world have to use a pill form packed with questionable fruit parts or fillers...We have the best! and it is quality you can see. Try some and please share with those who may need them. Choose Quantity 10 @ $2.00 ea = $20.00 20 @ $1.50 ea = $30.00 50 @ $1.25 ea = $62.50 100 @ $1.00 ea = $100.00 Fresh Picked Miracle Fruit Berries (Demand is very high as we seem to be the only large supplier of fresh fruit, non frozen.) If you want frozen we can easily pack our fruit with dry ice and ship them by expedited delivery methods. Please place an order or get on our waiting list for a specific delivery date. Our plants are producing right now. We strongly suggest you click overnight delivery if you will consume it, as it loses its properties within 4 days after harvest at room temerature. This fruit will be stem cut and packed in a clear plastic container with padding and an ethylene gas absorber to protect this very delicate fruit from going soft in transit. Don’t forget to plant the seeds! If you "only want seeds to plant" priority mail is fine and please type that in our additional comment box on our order form, this may lessen any wait as we have some imperfect fruits from time to time. Choose Quantity 1 @ $6.00 ea = $6.00 2 @ $5.00 ea = $10.00 3 @ $4.75 ea = $14.25 5 @ $4.50 ea = $22.50 10 @ $4.00 ea = $40.00 20 @ $4.00 ea = $80.00 Miracle Fruit 5-7" plants- or larger - we pick the best to ship every day so order early. These are seed grown plants at least 8 months old. The height is not as important as the roots and new growth. The plants we ship will be the best we have...and we have over a thousand to choose from. Small plants often have a slightly damaged leaf or two as they are very delicate when the new leaves form, and a Mirace Fruit will hold on to that leaf for a year before it decides it is no longer needed. Our plants are grown in real world outdor conditions so they are better able to handle some stress when you get them home. Please consider extra soil as this wil ensure the fastest growth and ultimate success of this plant. These plants are at least 3.5 years old and are forming new leaves, flowers and many are already fruiting. You will harvest fruit this growing season. This is a great investment as you will have fruit very soon and with our special soil mix this plant is growing fast. See results below. These are the extra unsold mediums from last year so their size has nearly doubled and are a great value. FYI watch out for sellers from abroad selling bare root plants by airmail, these plants are loaded with fungicides and pesticides and will suffer greatly away from an established soil with beneficial microbes that the plant depends upon. We bought some years ago and the results were miserable. Choose Quantity 1 @ $5.00 ea = $5.00 2 @ $5.00 ea = $10.00 3 @ $5.00 ea = $15.00 4 @ $5.00 ea = $20.00 5 @ $5.00 ea = $25.00 6 @ $5.00 ea = $30.00 7 @ $5.00 ea = $35.00 10 @ $4.50 ea = $45.00 PH Test Kit - This kit includes 6 test strips, test tube, high acid peat moss and complete instructions to adjust the PH of your water and/or soil to be within the perfect range for your miracle fruit plant. Without the correct Ph range you plant will either grow slowly, loose leaves or die. This is a very important product if you want to grow the perfect miracle fruits. See actual results below. Quick tip rain water is the best but stay away from chlorinated tap water. Choose Quantity 1 @ $9.00 ea = $9.00 2 @ $8.50 ea = $17.00 3 @ $8.00 ea = $24.00 4 @ $8.00 ea = $32.00 5 @ $8.00 ea = $40.00 10 @ $7.00 ea = $70.00 Nutrient Rich Soil "Miracle Mix" $10 per pint. Worth every Penny!... Even if we doubled the price. Enough to make your plant explode with new growth! It took 3+ years of testing but we cracked the Miracle Code for plant growth and fruit production. It is all in the roots - soil less mix to be more exact. Our mix has everything your plant needs and these are pictures of our plants to prove our point. Please read and learn from our experience. This same plant before the transplant into the "Miracle Mix" was supplying approximately 40-85 fruits every few months. Within four month this same plant had over 1000 new flowers forming and almost none have fallen off. This does slow ultimate production as so many fruit takes energy to produce, but with a payoff of 800% improvement in fruit production. We sell all the fruits we produce so this one plant with enhanced Miracle mix is worth hundreds during harvest time. Click on picture at right to see a larger picture of this same plant with over 1000 flowers forming on a 20" plant. Click Picture at right to see current Experiments and incredible Fruit Yields. REALLY BIG PLANTS -Forming Fruit - Not always offered as we sell the fruit they produce. The current Ebay Listing has completed.